As your security equipment supplier, SES wants to offer you the best products. Interlogix has released their new Simon XTi5 Crystal 3-1-1 Kit. The Simon XTi5 Kit has many updated features, building on the reliability from the original. This Kit is bigger than ever! What's exactly in the bundle though? This bundle includes (1) 5” Touch Screen v2, (3) Wireless D/W Sensors, (1) Wireless Pet Immune Motion Sensor, (1) Wireless 4-button Keychain Remote, (1) Battery, (1) Transformer, and (1) Jack and Cord Interface. Interlogix has added Z-Wave® lights, thermostats, and door locks, in addition to the image sensor; so you can now view recorded snap shots and look-ins in real-time. Ideally, this product is suited for security and safety monitoring for condos, homes, or apartments. With tons of add-ons available, all of the functions can be controlled remotely with any web enabled device through the web portal or mobile apps, which are powered by Alarm.com. 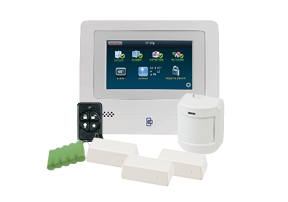 Get the Simon XTi5 Crystal 3-1-1 Kit now from SES, your reliable alarm system distributor. Check out the Interlogix website to learn more or click here to see the Simon XTi5 in action!